With the holidays right around the corner, you’ll be dusting off those old recipes and swapping favorites with friends and family. Need a few new recipe cards? 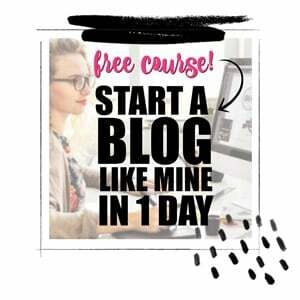 I’ve found some terrific free, printable recipe cards you’ll want to download. Keep weeknight dinners simple with these delicious 14 Weekday Crock Pot Recipes. No time to cook? No worries! These 19 Easy Crock Pot Recipes for Busy Families have you covered. There’s a Mason jar shaped card (so cute!) and vintage style recipe cards as well as cards with interesting designs and nice colors. I love the idea of the cookie swap recipe cards! Some of these downloads include a matching invitation, too. To keep you organized, there’s even the Matching Recipe Cards with Dividers and the Recipe Binder & Free Printable. Look them over, print your favorites and you can check one thing off your party supplies list for the upcoming holiday exchanges—–for free! Easily type out your family’s most treasured recipes with these editable recipe cards and dividers. The 4”x6” fit perfectly in a recipe box and come with dividers so you can keep your recipes organized. Choose from four different designs that can be filled out before or after printing, or mix them all up for a fun and colorful recipe box. I love making mason jar gifts for friends and family. Making some homemade treats and attaching the recipe using these free printable mason jar recipe cards is the perfect way to brighten someone’s day. These fun, vintage inspired recipe cards are adorable and come in two different colors. Print them on cardstock paper, fill out your recipe, and tie to a mason jar full of goodies! Summer is a busy time for cooking, baking, crafting, and canning. Canning parties are a great way to spend some quality time with friends and family while making some delicious goodies to get you through the winter. 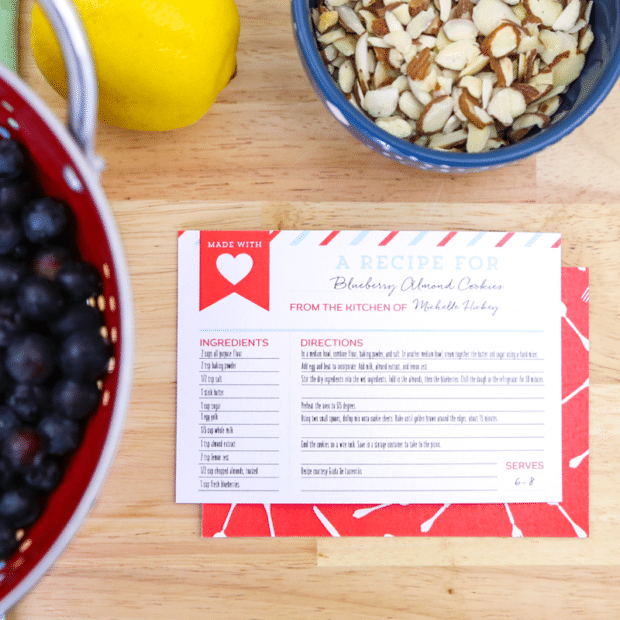 Send your guests home with your family recipe on these cute printable recipe cards. This post also includes the sweetest homemade tags and labels for your canning creations. Print your own beautiful recipe cards with these free printable cards perfect for keeping everything organized. Just simply download, print, cut and place inside your favorite recipe box. You’ll love filling out these cards to keep your favorite recipe on hand or to share a favorite meal idea with friends and family. Make me, bake me, and share me. Every good recipe has a beautiful story to go with it. 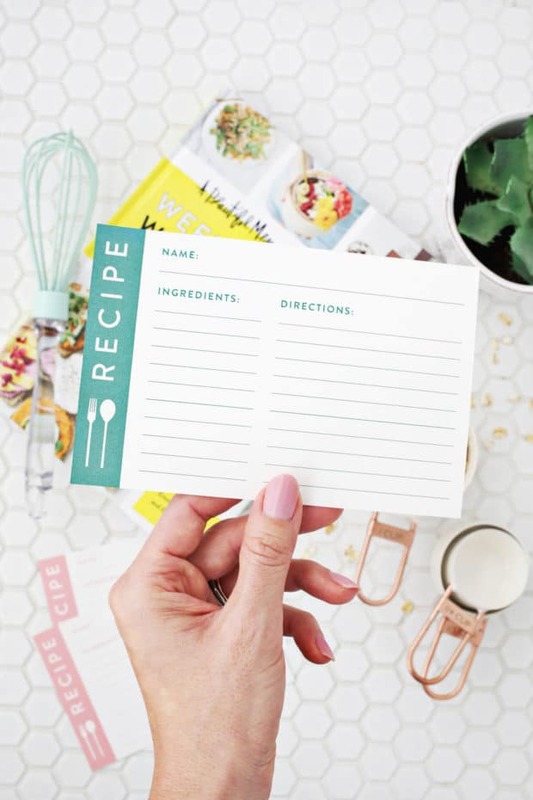 Whether you are cooking, baking, or sharing, these printable recipe cards are the perfect way to write down your recipes and keep them on hand. These adorable cards have colorful stripes and sweet messages across the tops. Print them out on some cardstock paper and you are ready to get cooking. Next time you are at the dollar store grab a funky binder and some basic sheet protectors to make this super organized recipe binder. The printable recipe cards are a half page, giving you lots of room to write down detailed recipes and leave little reminders for yourself. Each card also has space to write in the total prep time and cook time required. It seems like I am forever looking for a scrap piece of paper to write down recipes that I find online. Keeping some old-fashioned recipe cards on hand is the perfect way to stay organized and actually be able to find the recipes when you need them! These beautiful recipe cards come in two sizes so they are sure to fit any recipe box you already have. Or you can buy a new one from the dollar store, they fill up fast. Keep your favorite recipes safe for future generations with these free printable recipe cards. Simply print these cards from home or a print shop and place in a secure place or box. There’s plenty of room to write out your favorite meals and dishes and all the directions to complete your recipe card. Looking for a unique way to store your favorite recipes? Check out these free printable recipe cards that come complete with a section for ingredients, directions and serving sizes. Plus, has a space to put your information if you’re sharing your favorite recipes with friends and family. Stop wading through messy poles of recipe clippings instead of spending your time baking. 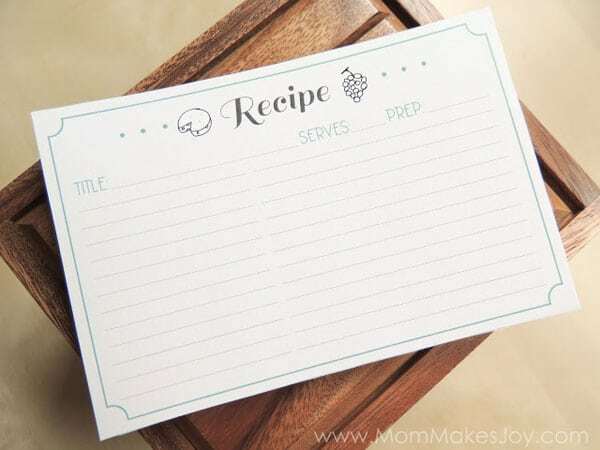 Organize your recipe collection with these fine vintage recipe cards that are simple to download and print onto letter sized cardstock paper. These cards are also perfect if you are giving away some homemade baking as gifts. Bundle your treats and recipe card with some ribbon for a special gift your friends and family will truly appreciate. A wonderful balance between vintage feel and modern style, these elegant recipe cards are the perfect way to preserve your most treasured recipes. They are easy to download, easy to print, and super easy to use when you need to write down a new recipe. Choose from orange or grey, then all you need to do is print them off and start writing. They are a wonderful way to take your mom’s recipes and your grandma’s recipes with you if you move away. Cookie swaps have become so popular over the holidays or any time of year. When you are putting together your cookie platters, attach a few of these cookie swap recipe cards to pass along with the goodies. That way your friends and family members can recreate your delicious treats whenever they would like! These would also be great to send with a tray of baked goods as a hostess gift at dinner parties.